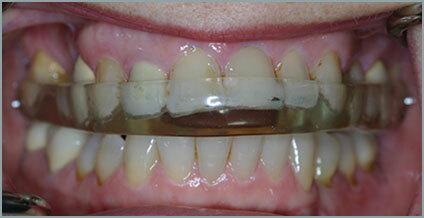 If the upper and lower teeth close incorrectly, they can become worn or unstable. In several cases, some patients experience pain in the masticatory muscles with potential noise from the temporomandibular joint, others may suffer from unspecified dull headaches that are exacerbated in times of stress. In such cases, early diagnosis is important and effective treatment of temporomandibular joint disorders as well as relaxation of contracted muscles that cause discomfort. Treatment is initially aimed at reassuring the patient and in a range of advice and even exercises, or the administration of anti-inflammatory drugs or occlusal splints that can be worn at night. Finally, if necessary, we carry out the restoration of worn dentition in order to give the mouth both maximum functionality and also its ideal aesthetic appearance. I have a dull headache at the temples or around the eyes. I have pain in front of and around the ears. What could be wrong? How can I deal with it? On the head, right in front of the ear, is the temporomandibular joint (TMJ), which, together with the jaw muscles and teeth, make up the stomatognathic system, (SS) which is coordinated by the brain. Thanks to the coordinated stomatognathic system, functions such as speech, swallowing, yawning and chewing are performed. However, some people may push the stomatognathic system beyond its natural operating limits. A result of such dysfunctional habits may be overuse and exhaustion. 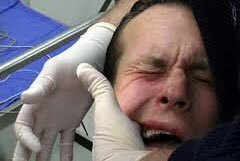 The habit of squeezing the teeth together, nail or pencil biting, frequent gum chewing or grinding very hard foods causes chronic injury of the stomatognathic system and over time automatically or in response to a damaged area, can lead to symptoms of tension-type headaches in the temples or around the eyes and forehead. In addition, cramped or painful jaw movements, limited mobility, or masseter muscles that are sensitive to touch, are all versions of the same pathology.In the science of dentistry, these are referred to as kraniognathikes disorders. The treatment which follows involves using an intraoral stabilization splint to eliminate occlusal interferences and relax the jaw muscles, physiotherapy and warm dressings, sometimes using muscle relaxants and anti-inflammatory drugs, etc. I wake up with a morning headache, even while sleeping I feel pain and discomfort. What is it and how can it be treated? One of the most common causes of headaches is the exhaustion of the temporal muscles due to lactic acid accumulation, resulting in anaerobic contraction, especially in people who have the dysfunctional habit of clenching or grinding their teeth (bruxism).In almost all cases, these patients have severe stress in their daily lives. Morning headaches are usually accompanied by a history of nocturnal bruxism along with a temporalis muscle which is sensitive to touch. 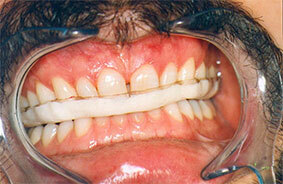 Many patients are not aware that they clench their teeth at night until their doctor reveals it. Some patients are provided with temporary relief by compressions on the temple area which increases blood flow to the muscles. In very painful cases, muscle relaxants and anti-inflammatory drugs in conjunction with specific physiotherapy for the muscles and the use of an intraoral stabilization splint helps. I grind my teeth at night. Can I do something to stop this phenomenon? 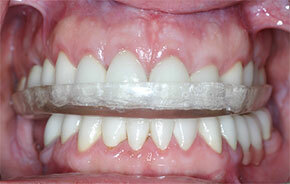 A large number of patients have a history of teeth grinding at night (nocturnal bruxism). Many are unaware of this, but there are some signs that may indicate a problem, such as if you wake up in the morning with a headache, pain, difficulty chewing and speaking, noise and pain in joints or when erosion is observed, chipping or wear of opposing teeth. Although the exact mechanics of bruxism remain unknown, it is certain that the cerebral cortex plays a role in the phenomenon, as it has been confirmed that stress exacerbates teeth grinding. The construction and use of an occlusal splint at night will not stop bruxism, but mediates between the teeth and prevents their greater abrasion. 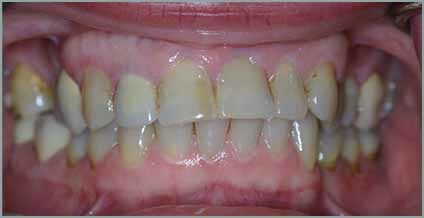 In many cases, when there has been a history of nocturnal bruxism and we have prosthetically restored the worn dentition, we complete therapy by providing a solid stabilization splint to prevent possible damage to our prosthetic. Every time I chew, I hear sounds. Is there a problem? What can be done? In most cases, the sounds from the TMJ is not a pathological condition. The creaking sounds may be intraarticular in origin due to a condition in the TMJ in which the joint surfaces rub together (osteoarthritis). In such degenerative cases, treatment is required. or there may be “clicking” sounds as a result of the contraction of the inferior head of the lateral pterygoid muscle, which participates in the coordinated movement of the condylar head system and double-jointed disc during the opening and closing of the jaw. When this muscle contracts (eg a parafunctional habit) then an uncoordinated movement of the condyle and disc is performed, resulting in disc slippage, causing the characteristic clicking. Therapeutic intervention is performed only if the patient presents dysfunctional symptoms (pain, limited ability to open the mouth, etc.). Otherwise the clicking is considered harmless and the patient is simply re-examined from time to time. In cases of clicking, however, where there has been anterior displacement of the disc, treatment is required in order to prevent the condition from worsening, which may lead to difficulties opening the mouth and eventually “locking”.